MONTREAL -- With its dark grey skin and prominent tusk, the young narwhal stands out from the pod of snowy white belugas it has joined in the St. Lawrence River, some 1,000 kilometres from home. But against all odds, the wayward arctic mammal appears to have become a fully integrated member of the group, serving as an example of the complex social bonds the animals can form, according to the scientific director of a whale research group. Robert Michaud said the narwhal was first spotted in 2016 swimming with a group of juvenile belugas in the river, well south of its usual Arctic range. Drone footage captured by the Michaud's group earlier this summer confirmed the narwhal is still with the same group, and had apparently become "just one of the boys," as Michaud puts it. He said the games and interactions between the narwhal and belugas were indistinguishable from those between the rest of the pod, suggesting the newcomer had been fully accepted by its companions. "This young narwhal is interacting with the belugas as if he was just another beluga, swimming with belugas," said Michaud, the scientific director of the Group for Research and Education on Marine Mammals based in Tadoussac, Que. The interspecies friendship is rare but not surprising, given that the two species are closely related and have similar habits, Michaud said. They're similar sizes, have similar lifespans, and both live in large, complex family groups. 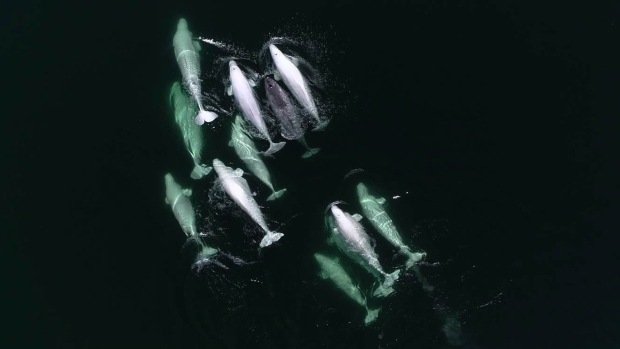 Michaud believes the belugas may have saved the narwhal's life, since many lost animals end up near boats or humans, which increases the chances of accidents. "Vagrant belugas that are isolated from their population, from their social groups like that often end their lives as solitary and have dramatic ends because they look for interaction," he said. "This little narwhal is a lucky one because he found some buddies." Marianne Marcoux, a marine mammal researcher with Fisheries and Oceans Canada, said the narwhal found in the St. Lawrence is "way south" of its range and likely just got lost. But even in the Arctic where they occasionally cross, groups of narwhals and belugas usually stick with their family groups. She's only seen one instance of a beluga swimming with a large group of narwhals, but didn't know if the animal had joined the group or was just passing through. But Marcoux says that narwhals are very social animals who show preference for certain companions over others, so she's not surprised the vagrant whale has made some "friends." "They need to create associations in order to survive in this environment, so they need to have co-operation between them, so if you want you can call it (friendship)...but I prefer to call it social relationships," she said in a phone interview. For Michaud, the interactions are yet another proof that whales exhibit much more complex social behaviours than previously thought. He said researchers have recently discovered that belugas are one of the few species on earth that go through menopause -- or stop reproducing before the end of their lives -- which he interprets as a sign that older generations remain with their pods to pass down knowledge to younger generations. As for the young narwhal, Michaud said it appears to be healthy, and researchers are curious to see whether it mates with a beluga in a few years to create a hybrid narwhal-beluga baby, which has been observed in skeletons but never studied in the wild.